This Retail Digital Transformation Infographic takes a look back at the retail industry 15 years ago vs. now. It’s hard to conceive the Future of Retail sometimes until you take a look back at the huge change the industry has transformed from over the years. What many things people rely on daily TODAY didn’t exist. Certainly mobile has a hand in changing consumer patterns and ushering in a new age of digital tools. However, Apple only released the iPhone 10 years ago. The Retail Digital Transformation Infographic takes a look back at the big brands we grew up with and never thought would go away, emerging brands that have completely flipped some industries that we never imagined 10 years or even 5 years ago. Most notably, Kmart and Sears went from $30B to multiple closures and Billions of dollars in losses in just 15 years. They didn’t bank on the e-commerce explosion and thought consumers would not change their behaviors. Many categories that consumers are getting more comfortable buying online (higher ticket items) are ones that having large amounts of growth. Appliances, furniture, electronics and other higher priced categories that historically consumers wanted to go see, touch and feel. These categories directly correspond to retailers losing in the brick and mortar game like Circuit City, Radio Shack, and Sears. Retailers who offer experiential shopping are flourishing such as outdoor malls, Class A Malls, luxury stores and sporting goods. Consumers are not just going to these places for a quick in/out to grab an item (like a traditional store/mall), they are going for lunch, coffee or to hang out. They were innovative before their time, people doubted them for being progressive. These brands appeal to younger demographics because they are authentic, transparent and have a mission. Hence, they have gone viral and got huge word of mouth reach for their mission and/or experience. These retailers started purely as online players and some have opened up brick and mortar locations after being successful online. The retailer focuses on providing convenience through innovative technology and brand themselves by providing high touch Customer Service. 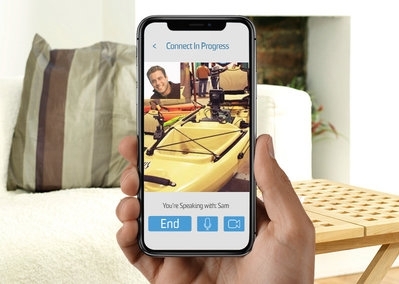 To learn more about Video Chat for Retail and the Future of Retail.